Running into a building with guns blazing and a mask on one second, and the next second I’m cowered around a corner hoping no one knows I’m in the room. My head is spinning. I thought I was the aggressor, so why do I feel like the victim all of a sudden? 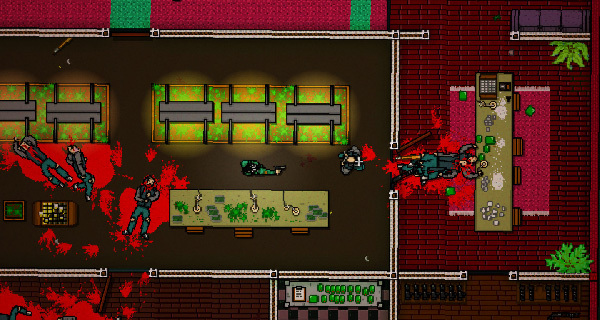 Hotline Miami 2: Wrong Number picks up the action (and my heart rate for that matter) right where its originator left off. Its murder puzzles quickly change up right around the point where you start to decipher a somewhat coherent story. The devil is in the details of Hotline Miami 2, and I was surprised to find that it scratched a different arcade itch than the first game. I found myself doing a lot more planning and ammo conservation instead of brute force trial and error. The methods are different, so the fun is different, but the victories are still bloody satisfying. Thanks for the murder diversification, Hotline Miami 2.